Thus spoke de Valera, in his famous 1943 St Patrick’s Day speech, laying out his vision of the ideal homeland that Irish men might soon be called upon to protect from a possible German or Allied invasion.2 This was nothing short of an elegy to an imaginary, ever-agrarian Ireland, with harmonious ideals of vigorous masculinity and submissive femininity at the centre. Long before de Valera’s speech, however, Irish nationalists had conflated national sovereignty and masculine strength. National power was conceived of as male potency and the recovery of one would supposedly parallel the recovery of the other. 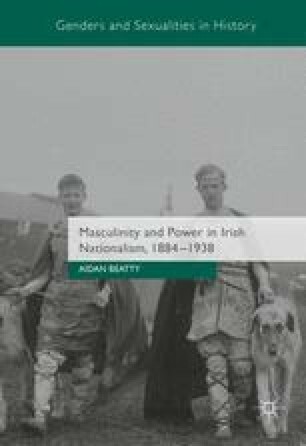 This book is a history of how these notions of power and masculinity came to predominance in Irish nationalism, of the forces that fed into them, and of the ideological work that masculinity and power did for Irish nationalism. This work traces these ideas back to the 1880s and shows how they continued to have resonance into the 1930s. There is an especial focus, however, on the years between 1912 and 1923.